Fishing has been good for mackinaw. Best action has been off the Tahoe shelf out of Tahoe City or Carnelian Bay to Cal/Neva Point. Star out early morning in 120 feet and move out to 180 feet as the sun comes up. By 9;30 the bite will dropped off dramatically. Blades or flashers with a live minnow has been most productive. Many limits have come in for mac's in the 2-7 pound class with a few in the 8-18 pound class. The kokanee action has been hit and miss. Most anglers have been fishing off Camp Richardson in 300 to 400 feet of water. The kokanee have been suspended 60 to 100 feet down. The Cave Rock boat launch is scheduled to open October 15th if construction goes well. Water temperature on the lake have been 58 to 63 degrees depending on the time of day. As temperatures go down, the top line bite should pick up for rainbows and browns. 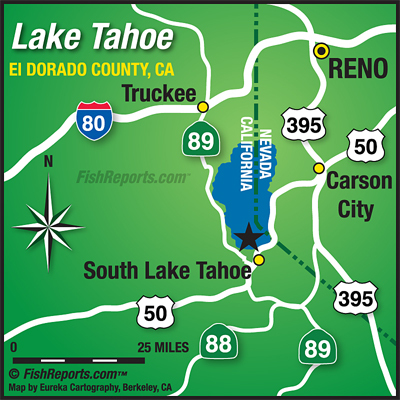 For more information or need to hook up with a Lake Tahoe guide. Call Blue Ribbon Fishing Charters at 530-544-6552.